Betty Qualtrough (nee Peterson) married Alan Qualtrough, a descendant of the Reverand Joseph Qualtrough and Agnes McCullough. Eulogy - written by her son Malcolm Qualtrough with anecdotes from other family members and friends of Betty’s. Eulogy was presented by daughter-in-law Jill. Ethel Betty Peterson was born in 1927 somewhere in Coburg. Her Father Peter Martin Peterson, a painter, and her mother, Emily Victoria Riddle lived near Pentridge Prison. At some stage, for reasons we don’t know, Emily left her husband and she and the two girls Betty and younger sister June worked their way through NSW, and up to Queensland. They stayed some time with either a Greek or Italian fisherman at Burleigh Heads, living in a tent on the beach. Here, Mum’s sister Vonnie was born. After a while they eventually ended up in Brisbane, and then moved on to Toowoomba, and then to Pialba, a suburb of Hervey Bay near Maryborough. At some stage Betty’s mother married George Evans who was a fettler on the railways. 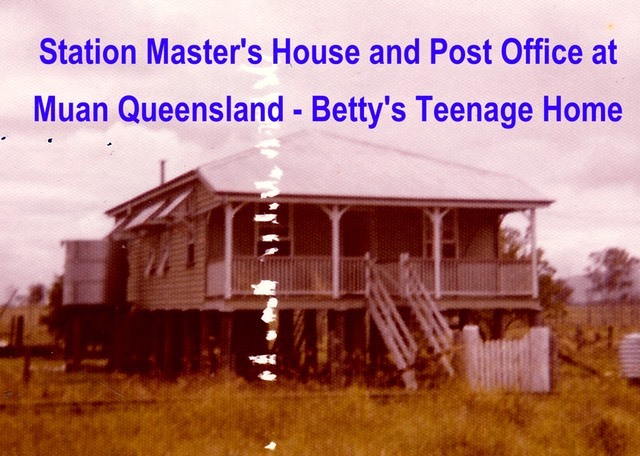 Betty’s baby brother Bob arrived on the scene and they moved out to Muan, a small town inland from Hervey Bay living in a Railway house that doubled as the station and the Post Office. Betty’s Mother also ran the telephone exchange. It was wild and desolate country in the depression of the 1930s and 40s. Betty was only 11 years younger than her stepfather and they enjoyed life. They competed in the local tennis competition together. Brother Bob looked to Betty as more of a mother than a sister. Betty enjoyed tennis for many years after until she was 50 years old, when a back operation put her out of action. The good life was not to last; and when Betty was 17 years old, stepfather George Evans swallowed some grass he was chewing on and died of tetanus in the Maryborough hospital. The war ended; Betty’s mother - now with 4 kids, boarded a troop train heading down to Victoria. Back in Coburg, Emily, and Betty’s Grandmother and Pop Riddle ran a small shop, which supplied small goods, lollys and cigarettes to the Pentridge guards. Young Bob was the courier and each day was locked in by the guards, who threatened to keep him there, when he had to do the deliveries. Betty and June worked in Walkers Pastry Shop in Sydney Road. One of the pastry-cooks was young Alan Qualtrough who had just been discharged after months of recovery from the effects of his time in New Guinea. Alan and Betty married in 1947 in the Coburg Church of England, and then moved to Bendigo, to be near Alan’s parents and other family. The rest of Betty’s family moved in to Mary St next to the Coburg station and lived with Sid Shackelton (Mr Shack) and his son Max. For years Betty and Alan would take their two boys Malcolm and Ian to visit and stay at Mary Street. It was a great treat for the boys who remember the trips down by car or train, and many tram trips to the City and Coles or Myers Cafeteria. This could be the end of the story of Betty’s Mother; but no she went on to have two more husbands, living in Avoca, Noble Park and Maldon, after Mr Shack died. Emily Victoria is buried in the Bendigo Cemetery in an unmarked grave. 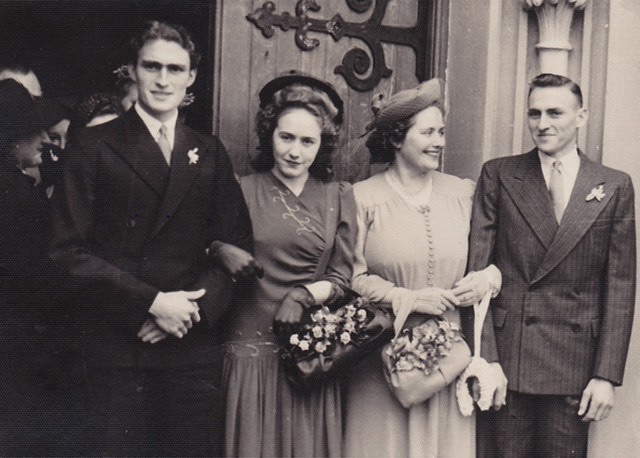 When Alan brought Betty back home to Bendigo the Qualtrough family immediately accepted her, in particular the young ones, Peter, Rodney, Phillip, Neil and Margaret. She leaned on her experience and was to give plenty of sound advice to them over many years; especially to Margaret when she was being courted by Howard Mathers. Alan and Betty rented a miner’s cottage in Allingham St near the Kangaroo Flat Station. Rod and Phil used to get on the train from Bendigo to visit. Ian was born in December 1948. Because of his disability he was to live with Betty and Alan for the next 64 years. Malcolm came along and they rented a larger house in McIvor Road from Alan’s uncle. There are many happy memories here of Christmas Dinners and relatives visiting, bonfires across the street, evening meals on the front verandah in the summer time, polishing the lights on Dad’s Model F Ford and making sure to keep clear of his vegie garden. Mum was a great cook and the family never went hungry. Mal thinks the relatives mostly came for his mum’s cooking. Betty’s cooking was exceptional, whether it was steak, chops, sausages or the endless supply of chocolate and sponge cakes, cup cakes, toffee, you name it – the supply line for the hungry family never stopped. I personally remember so often being insanely jealous of her roast potatoes – crispy and crunchy on the outside and hot and fluffy inside, cooked in the old square electric frying pan on the red formica bench in her little kitchen in Belle Vue Rd. I could never get them the same. A laundry and copper out the back, a chip heater in the bathroom and one cold tap in the kitchen, Mum had her hands full, especially with Malcolm who was a chronic asthmatic at the time. Over the years she nursed both kids through flu’s, colds, chicken pox and measles. Betty was Alan’s chief assistance when she and Alan collected wood for many years up until the 1980s. Dad would cut down the trees, and Mum would be the gopher whilst Dad split logs. Billy boiled tea and sandwiches for lunch was usual; then the rest of the family including Mum would stack the wood in piles for the inspector to measure; or load the trailer. Alan and Betty attended St Andrews church and were regulars at the games nights playing ‘kootie‘ at the Bendigo East Hall. They had regular card games playing canasta or euchre with their friends Keith and Ida White in Golden Square, and the Darby Family in Kennington. Good friends also were Malcolm and Joyce Morrison. Malcolm and Joyce lived in a government house attached to the Bendigo Ordnance. Alan had met Joyce who was preaching at a Presbyterian church in Queensland during the war. They later met up again at St Andrews. Joyce already had two children when a set of twins arrived. Indicative of Mum’s character is that she offered to clean their house free of charge once a week. This she did for more than a year to help her friends out. When all the Aunts and Uncles visited Alan’s parents at Belle Vue Road – every night was euchre night in the small kitchen. Unbelievable cheating and backstabbing went on for all hours of the night; whilst Malcolm and Ian would sit in front of the kitchen fire waiting for the cold drive home. Mum earnt extra money by working as a housekeeper and cleaner for people around the neighborhood. Malcolm, not old enough to attend school got used to entertaining himself in strange houses and keeping out of her way. Mum became very good friends with one of her clients, Leo and Mrs Cohn at their mansion on McIvor Road Hill. Around 1960 Mum, always a gambler right up to the end, won $300 in Tatts. This was enough for Dad to take out a War Service loan and build the house next to his parents in Belle Vue Road. Mum’s gambling habit was legendary probably because she won often. It started we think at the spinning wheel stalls at the Easter Fair. We always came home with boxes of chocolates and other goods. Dad’s sister Margaret saw a large doll she liked every Easter at the fair; but could never win one. Mum said leave it with me and she did. Margaret cherished that doll for many years. Mum continued to play her tennis over at Kennington, and occasionally travelled down to Melbourne to play in competitions. Every so often she set off to Melbourne on the train by herself. This was great; we met the night train at Golden Square and soon got in to the sugared peanuts or Darrell Lee goodies that she bought back with her. Ian attended the special schools at Kangaroo Flat and Violet St. Malcolm went on to High School at Golden Square; whilst Alan worked all hours on the trams. Mum enjoyed her cooking, knitting, tennis and especially fishing. Most weekends we went out to Lake Eppalock or somewhere on the Campaspe fishing. She always caught more than anyone else. One day up near Rochester she got a hook through her finger. 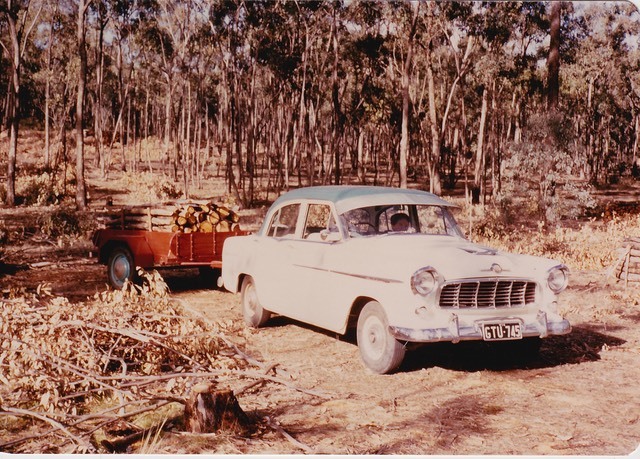 Dad had the old Holden FE wound up to 95 miles an hour to get her to the hospital at Elmore. Each weekend Betty and the family went to the drive-in or the picture theatre, or both. She knew all of the film stars and would announce who they were as soon as they appeared on the screen. She was particularly fond of the likes of Gary Cooper, Charlton Heston, Randolph Scott and Chill Wills, and we tried to pick music for the service today from singers she liked back when she was growing up and raising a young family. Malcolm was married to Jill in 1974 and Jill was immediately accepted in to the family. In her last days, Jill was the one that Mum relied on, to translate what Alan or Malcolm were trying to tell her. It often helped if she put in the hearing aid that she always said “she didn’t need”. Mum said that she would never leave Belle Vue Road but after she had a couple of falls, Alan and Betty sold up and moved to Village Life where they had three units side by side with Ian. This worked well for a few years before Ian transferred to Benatas at St Lawrence Court where he lives today. Village Life changed hands and Mum was having difficulty walking. Looking back now it was none too soon when they moved in to Strath Haven. Mum never really accepted the move and it was difficult. Three months ago she was moved in to critical care, with severe arthritis in both shoulders. Mum enjoyed her grand daughters, and then her great-grand daughter Emelyn. Mum constantly spoke about “the little girl” and loved looking at Emelyn’s photo. Because she had bought up two sons; we are not too sure that she knew how to handle Sue or Kerry, but she never interfered with their upbringing or offered too much advice to them. She did enjoy the trips to Eildon when the girls were in Primary School and made sure to come over to see them perform in the school concerts and plays. Alan and Betty always arrived with plenty of extra food. They always enjoyed a drink at Christmas lunch; which was usually in the back yard. Of recent times, Betty began to make less sense when we visited her in Strath Haven – and we must sincerely thank all the staff there who took such good care of her, even when she was being a little difficult. Dementia had her in its grip and she was losing her hearing, (and her hearing aid!!) so conversations were interesting between her and Alan, with Malcolm and I soothing troubled waters as best we could.